If you have not yet arranged a Calderstone account, or have a question, please call Lisa Maloney on 020 8391 3007 or e-mail her. Are you involved with specifying print jobs? If so, you will know that selecting the right weight of paper, whether to use gloss or matt coated and deciding what laminate to use, if any, can be quite a challenge. So how can we help you? Here’s how. 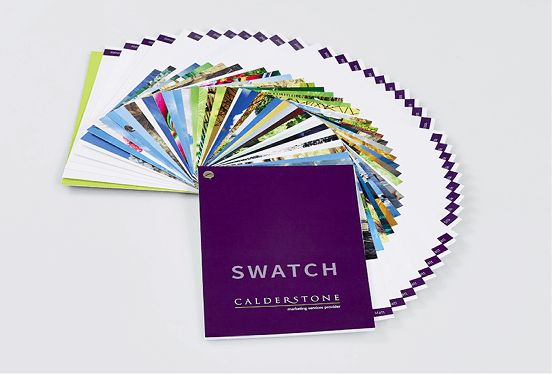 We have produced an A5 sized swatch creatively displaying the most commonly used paper and board weights, all in gloss, silk, matt and uncoated finishes as well as including the most popular laminations. Simple but effective.